Year of Faith Silver Proof! 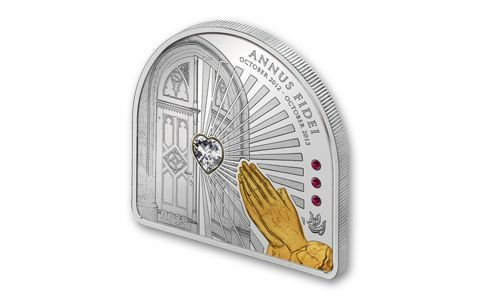 This 2013 $5 Year of Faith Silver Proof celebrates the year-long call of Pope Benedict XVI to "an authentic and renewed conversion to the Lord, the one Saviour of the world." The Pope declared it to begin on October 11th 2012, the 50th anniversary of the opening of the Second Vatican Council. 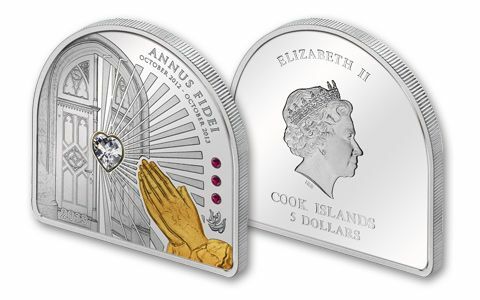 The proof is struck in a dome shape, and features golden hands in prayer and a heart-shaped Swarovski element with light streaming from its facets. Behind it, a church door opens to invite believers inside. 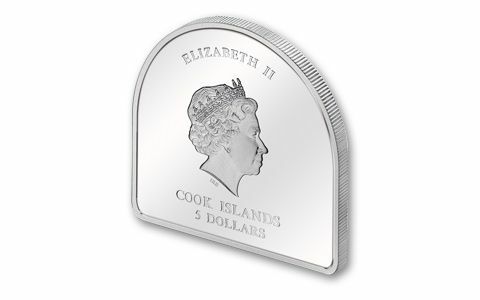 Each proof is minted in 25 grams of 99.9% silver, with only 5,000 struck for world-wide distribution. Your proof comes in mint packaging with a certificate of authenticity. We invite you to secure this enduring reminder of faith and prayer.